I have looked at pictures of this in the past and I have never been, but I'm glad that I will be able to check this off the bucket list because we plan to go this year. 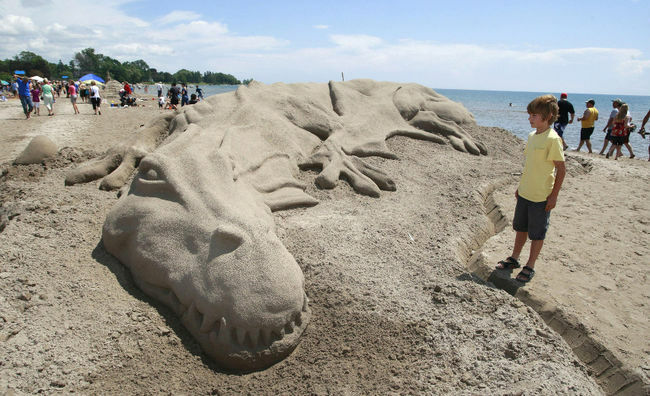 Each summer, for the last 10 years, Cobourg has held a Sandcastle Festival during the Civic long weekend where over 8,000 visitors come to see the works of sand art from master sculptors. The competition is open to anyone since there is both an amateur and a professional division. To top it off, there is a live DJ, kid-friendly events, and sand sculpting lessons. And, at the end of the day, it ends with a Movie on the Beach under the stars. Apparently, for this year, their 10th anniversary, there will be fireworks as well!